Home > Special Articles > South Delhi, South Mumbai, South Chennai, South Kolkata, South Bangalore - the Southern parts of any metro city have always ranked at the top of that city's property pyramid. ..! South Delhi, South Mumbai, South Chennai, South Kolkata, South Bangalore - the Southern parts of any metro city have always ranked at the top of that city's property pyramid. ..! Be it South Delhi, South Mumbai, South Chennai, South Kolkata or South Bangalore - the Southern parts of any metro city have always ranked at the top of that city's property pyramid. Who’s Who of the city. If one wants to announce oneself or one's business socially, buying a home or opening an office in these parts has always been seen as a pretty good bet. This phenomenon still continues; however, with the passage of time, newer areas are competing with these legacy areas and are attracting the younger rich and the neo-rich. Different cities are seeing this happening, largely because of the extremely limited new supply of residences in prime neighborhoods. However, where there is any availability, wealthy buyers will always prefer a home in the Southern part of a city. In Mumbai’s case, south-central Mumbai has finally shed the image of the mill district and now has superlative trophy projects under construction. Bigger land parcels available in these areas allow design flexibility and grandeur that can differentiate a contemporary asset from a legacy asset. Other than Lower Parel and Worli in south-central Mumbai, areas like Bandra, Juhu and Powai have also made their mark as new age posh localities. In Delhi, it is a different story. Delhi’s land is largely controlled by the Delhi Development Authority (DDA) and other Government agencies, so there is little land left under private ownership where newer luxury projects can come up. South Delhi’s posh neighborhoods - Green Park, Safdarjung Enclave, Panchsheel Park, Greater Kailash, Vasant Kunj, etc. remain as popular as ever. While only 'builder floor' type of projects are available to the rich clientele, South Delhi will always remain the preferred destination for legacy home ownership. While South Delhi may have little to offer to luxury home buyers with less exuberant budgets, Delhi’s loss is Gurgaon’s gain. Gurgaon is clearly the hotspot for the younger class of buyers of prime residential offerings. Along with Gurgaon, parts of NOIDA and Greater NOIDA are also offering world-class projects attracting HNI buyers. In Chennai, the southern prime districts have followed a natural extension to Old Mahabalipuram Road (OMR) and East Coast Road (ECR). Some years back, South Chennai comprised of areas like T Nagar, Mylapore, Adyar, Alwarpet, MRC Nagar and San Thome. 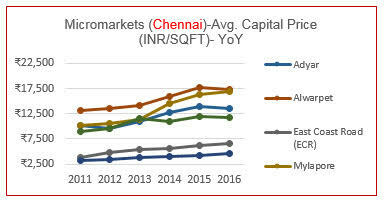 These areas were always prime, and with the city growing further south, these localities are considered as central Chennai now - today, South Chennai more or less means OMR and ECR. In Kolkata, the prime luxury housing story is still pretty much about the Southern neighborhoods of Alipur, Jodhpur Park, and Lansdown. South Kolkata’s parts of Ballygunj and Elgin command high prices, but there is no new supply of projects. 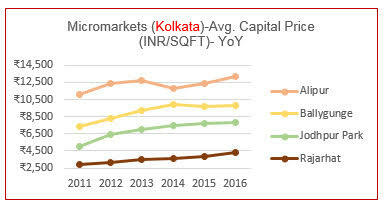 So, while South Kolkata still enjoys phenomenal demand for high-end residential properties, lack of supply has prompted buyers to look out other areas further south of in newer areas like Rajarhat. There is a possibility of shifting the focus of residential activity to other parts of the city for sheer lack of new construction opportunities in South Kolkata in the proportion of demand that exists. 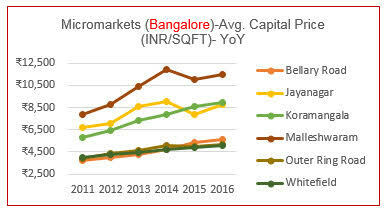 In Bangalore, we have seen the all-round emergence of newer prime locations breaking South Bangalore’s dominance. Extensions to Koramangala, Jayanagar, and Malleshwaram and the emergence of the Bellary Road corridor, Whitefield and Outer Ring Road are now convenient locations feeding into the city’s IT districts.